CANTON, Mass. (June 30, 2014) – Summer is here and Dunkin’ Donuts, America’s all-day, everyday stop for coffee and baked goods, is celebrating the season with a special selection of new and returning menu items. 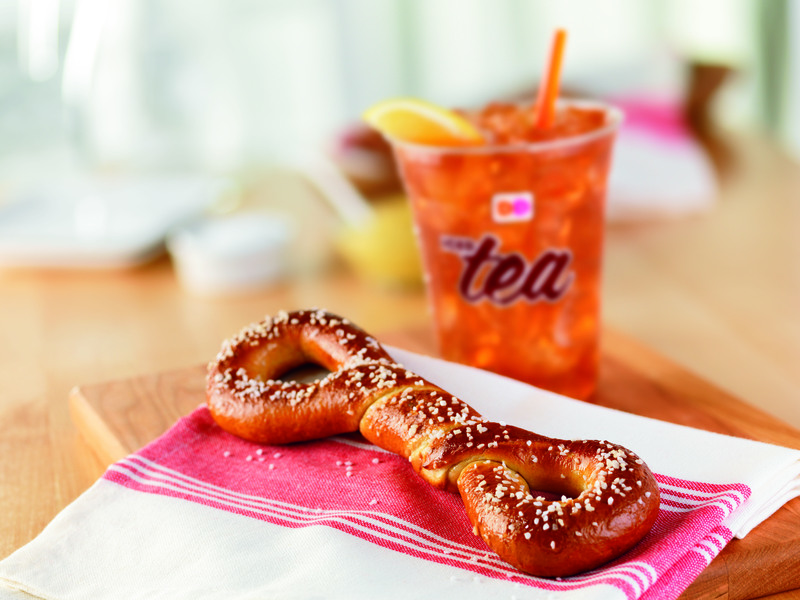 Leading off, Dunkin’ Donuts has a new twist for the taste buds, introducing the Pretzel Twist, featuring a traditional warm, soft pretzel twisted and sprinkled with salt. This delicious all-day option is perfect for on-the-go guests and pairs well with any of Dunkin’ Donuts’ iced beverages to stay cool throughout the summer months. Dunkin’ Donuts is also heating up its lineup of breakfast sandwiches by bringing back the Southwest Steak Burrito. Inspired by the bold and hearty flavors of the Southwest, the Southwest Steak Burrito features scrambled eggs, seasoned steak, fire-roasted vegetables, potatoes and Pepper Jack and Monterey Jack cheeses, all wrapped in a tortilla. Finally, to add a little sweetness to summer, Dunkin’ Donuts is bringing back two popular OREO® cookie inspired donuts. The OREO® Donut features a yeast ring donut frosted in white icing and topped with OREO® cookie pieces; while the OREO® CREME Donut is a yeast donut, filled with vanilla flavored buttercreme, frosted in white icing and topped with OREO® cookie pieces. For another cool twist on the classic OREO® Cookie, Dunkin’ Donuts is also offering OREO® Frozen Coffee and OREO® Vanilla Bean Coolattas through the summer months. All of Dunkin’ Donuts’ newest menu items are available for a limited time at participating Dunkin’ Donuts restaurants nationwide. To find a participating Dunkin’ Donuts restaurant near you, visit https://www.dunkindonuts.com/aboutus/store/Search.aspx. To learn more about Dunkin’ Donuts, visit www.DunkinDonuts.com or follow us on Facebook (www.facebook.com/DunkinDonuts) and Twitter (www.twitter.com/DunkinDonuts).